Derek Ratcliffe was arguably the most outstanding field biologist and conservationist of the 20th century. 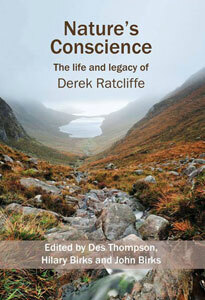 This book explores the breadth, quality and legacy of Derek’s work and has many personal reminiscences. The 30 contributors provide fascinating insights to a remarkable person, and events and issues which have shaped wild nature as we see it today. Beautifully illustrated, this is a deeply inspiring book. It will appeal to a wide readership, curious about what makes someone so special and united by an eagerness to see wildlife flourish. ..produced a book which will be of interest to those concerned with the natural history of the British Isles, but which also has relevance to a wider international audience. The book is a substantial volume, and copiously illustrated; not only are there numerous photographs of high quality, but there are also paintings by two landscape artists, Will Williams, and David Bellamy, which capture the environments which for so many years inspired Derek’s life and work. The publishers are to be congratulated on producing a work of such high quality at such a relatively low price. It is a book to be dipped into and savoured. conservation strategy. More than this, he inspired a generation of younger scientists and practitioners, many of whom have penned a chapter in this volume….. Go on and read this book for yourself, and see. It is truly inspirational and should be compulsory reading for first year ecology and conservation courses. This book is well organised and richly illustrated throughout. The editors have done a fine job in drawing together the varied contributions from many different authors into a coherent whole. It will have wide appeal to anyone interested in nature conservation in Britain and is a fitting tribute to one of the most outstanding field biologists, conservationists and natural history writers of recent times.